the treatment of cancer, by the insertion of radioactive DEVICES directly into the tissue. Brachytherapy uses highly localized radiation to destroy cancerous tumors by placing a radioactive isotope directly inside the treatment area. The product delivers therapeutic radiation from within the tumor without the entrance skin dose and associated side effects of treatment that characterize external-beam radiation therapy. This feature allows safe delivery of higher doses needed for treating both non-resectable and radiation-resistant cancers. According to Global Industry Analysts, by 2025 the U.S. brachytherapy market will reach $2 billion. It is estimated that the U.S. market represents approximately half of the global market. Vivos believes there are significant opportunities in prostate, breast, liver, pancreatic, head and neck cancers. The 2019 U.S. estimated new cases according to the American Cancer Society are 240,000 prostate cancer, 235,000 breast cancer and 31,000 liver cancer. Vivos has exclusively licensed Yttrium-90 (Y-90) polymer composite technology from *Battelle Memorial Institute, developed at Pacific Northwest National Laboratory, a leading research institute for government and commercial customers. Subject to receipt of all required regulatory approvals from the FDA in the United States and analogous regulators outside of the United States, Vivos plans to introduce a new Y-90-based brachytherapy product line for a range of applications for the delivery of a prescribed dose of radiation to a target site. 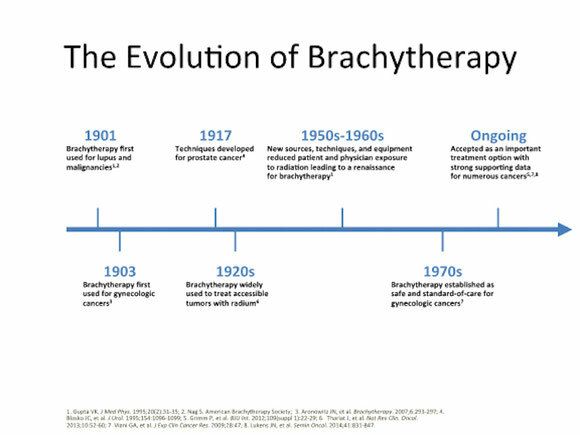 Reliable sources estimate that annual Global sales of brachytherapy products currently exceed $1 billion; about half of which are in the United States. The size of the U.S. brachytherapy market for prostate cancer brachytherapy is somewhere between $90 million and $130 million per year. The market for liver and breast cancer combined is comparable. •Maximizing Therapeutic Index: The short-range beta particles emitted by Y-90 deliver radiation energy within a tight range. This enables radiation to be selectively delivered to target tissues while minimizing radiation dose to nearby normal tissues. High therapeutic indices imply that more radiation energy may be imparted to target tissues, with less radiation reaching adjacent normal tissues. •Half Life: Y-90 has a half-life of just 2.7 days. Many traditional brachytherapy products use isotopes with longer half-lives such as 9.7 days for cesium-131, and sixty days for iodine-125. •Optimized Delivery Method: Current brachytherapy devices place permanent metal seeds in the prostate by using up to 30 large needles. By contrast, Vivos’s Y-90 RadioGel™ device is designed to be administered in a minimally invasive procedure with small-gauge needles. •No Permanent Seeds Remaining: Current brachytherapy devices place permanent metal seeds in the tumor. Vivos’ Y-90 RadioGel™ device utilizes a biodegradable, non-toxic polymer that is ultimately absorbed by the body. This eliminates the possibility of a long-term seed migration or other problems that may sometimes arise when seeds remain in the body. •Good Safety Profile: Many traditional brachytherapy devices utilize isotopes that emit x-rays (akin to gamma radiation). X-rays or gamma radiation travels within and outside of the body and have long half-lives. Vivos’ brachytherapy products use the Yttrium-90 isotope, which is a beta-emitter. The Yttrium-90 beta-emissions travel only a short distance and has a short half life of 2.7 days. •Potential Lower Cost: Yttrium-90 supplies are readily accessible and are relatively inexpensive. The elimination of the metal or glass enclosures used in traditional brachytherapy seeds greatly reduces manufacturing costs. * Battelle is the world's largest independent research and development organization. Headquartered in Columbus, Ohio, Battelle oversees 22,000 employees in more than 130 locations worldwide. Battelle has managed the U.S. Department of Energy's Pacific Northwest National Laboratory in Richland, Wash., since the laboratory's inception in 1965.